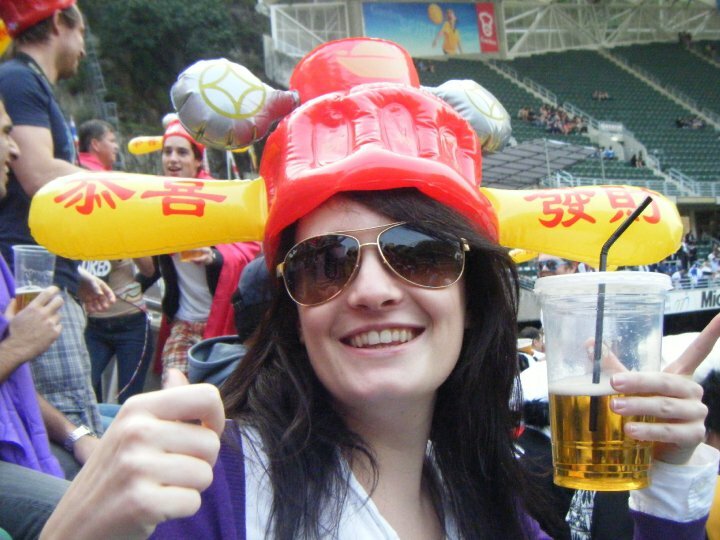 Here’s the second installment of my study abroad adventures in Asia. Read how I began my exploration and continued acclimation to my new home away from home. Well! It was quite a full first week for me in Hong Kong, to say the least. 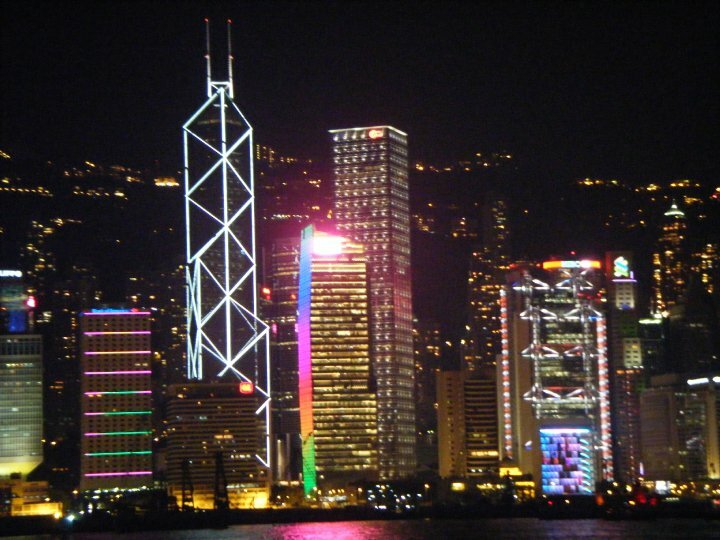 A view of the city skyline at night. 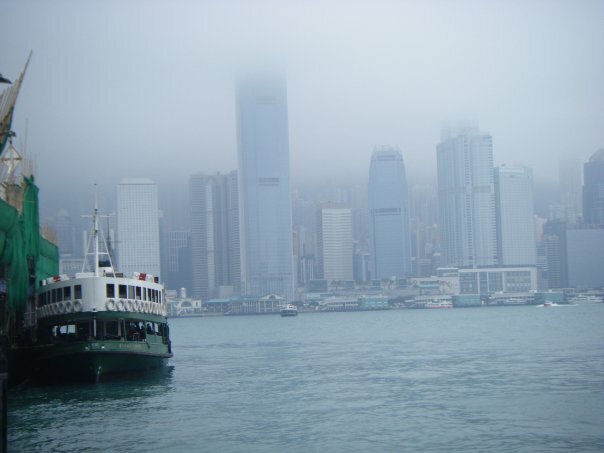 This was when I truly began to fall hard for Hong Kong. Since arriving, I’d been to Stanley Market and Victoria’s Peak, ridden the tram down from the top (which naturally had a Burger King and Bubba Gump Shrimp company on top), visited Wong Tai Sin temple in the middle of Hong Kong, watched the horse races at Happy Valley one evening (and watched others throw away money betting with no idea what the stats meant), and wandered in awe around Tsim Sha Tsui (TST to everyone else) where some friends and I bought hydro-foil tickets for a day trip to Macau the following weekend during the Chinese New Year. Whew! And I’d already eaten more rice, noodles, dim sum, general carbohydrates and things of no discernible origin, than ever before in my life (my mantra in Asia quickly became: If it tastes good, eat it). Milk, cheese, salads, vegetables, and fruit (especially in raw, uncooked forms) seemed to be a rare delicacy there. For the most part; I felt very deficient on vitamins, calcium, and other nutrients commonly found in the US diet. Cravings for a big salad haunted me – especially during the beginning of my semester abroad. I decided that would probably be the first thing I’d ask for upon return to the US in June (or so I imagined at that point in time anyway; turned out I wanted nothing but Hong Kong bubble tea with giant tapioca pearls upon my return, but that’s for another time). If YOU can identify any of this, you have a better eye than me! We had a couple of days off from school for the Chinese New Year holiday, so in addition to going for a group hike at Tai Long Wan beach on Saturday, my group of exchange friends and I decided to start our traveling and sightseeing while studying in Asia by doing a day trip to Macau (the island about an hour’s ride south of Hong Kong) on Sunday, returning in time for the parades and fireworks in the city on Monday. Classes (oh yes, I did go to ‘study’ something in between travels, didn’t I?) were fairly good to begin with; I ended up switching a few around (not quite as interesting in reality as the course descriptions made them out to be), and I quickly decided to drop Beginning Mandarin (five classes was a lot to handle, and after the first two classes I realized, “Wow! This is going to be harder than I thought. People weren’t joking when they told me that.” – shocker, I know) but I did decide I wanted to study it on my own time, so I planned to buy some books for beginning Chinese (my friend Jen, lent me hers and it seemed really good) and try to learn some Mandarin that way. Spoiler: I never got around to it. I made a lot of new friends fast; almost all of the exchange students were friendly, and my roommate Katrin, from Austria, turned out to be great, (best roommate I had all through college actually) the longer we lived together. She liked to stay out a little late for me (5 AM or so), but I hoped she’d calm down once classes really get underway. Spoiler: that was wishful thinking – the Europeans really know how to party and drink. 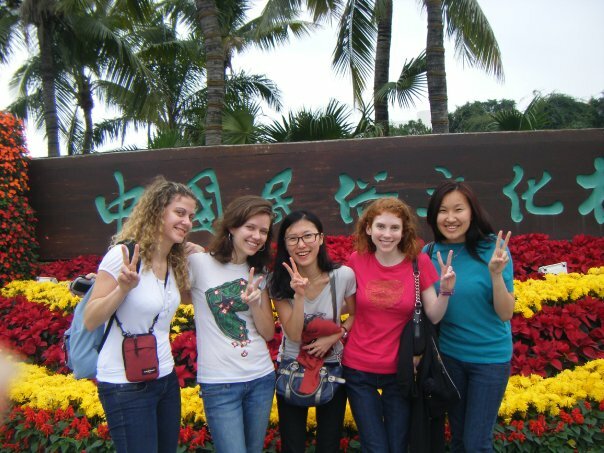 Some of the girls I became closest to during our time abroad. We all came from different cities and countries, but we made so many memories together that I’ll never forget. Early on, I also made friends with a couple of girls who were roommates from Italy and Amsterdam and had similar class schedules to me (Monday thru Thursday), so we started hanging out a lot together. It was fascinating talking to them because their universities, politics, and country’s policies are so different from America’s, and yet some things are also similar it seems no matter where you live. To be honest, I didn’t have too much interaction with the full-time, local students; they tended to stick to themselves and speak Mandarin or Cantonese unless in class and forced by the professor to speak English, so it was a little challenging to engage them. It struck me as funny that they came to a university which teaches primarily in English (I would assume to become more proficient in the language), and all the majority of them did was speak Chinese whenever they could. Oh well, the few that I did talk to early on had been very nice and helpful. I also joined a student group at HKUST called, the Exchange Activities Committee (EAC), composed of two local students and three exchange students each semester, whose purpose was to plan group outings facilitating intermingling between local and foreign students (the previous semester they’d done things like a harbor tour, a day hike and kite flying, etc). It seemed like an excellent way to see more of Hong Kong, meet more people (local and foreign), and get more integrated and involved on campus (not to mention pad my resume); I wanted to make at least a bit of a difference while I was there. This is the fog I was talking about that can easily envelop the whole island at times. And let me tell you, the actual city of Hong Kong is by far the most energetic, interesting, and FOGGY place I’d ever been. Almost every morning (at least in the beginning), I’d woken up to fog outside my window on Kowloon Bay, and although it wasn’t what you’d call warm (about 60-65 F degrees), it was much, much better than my home in St. Louis, MO during February. The humidity was unbelievable too (my bath towel never fully dried out before I showered each day) and the nights could get quite chilly on campus, but once you went further inland into the city, it warmed up more quickly. The radical temperature shifts due to proximity to the water was truly stunning – like San Francisco, but even more so. More updates soon. Until then, enjoy a few more pictures. 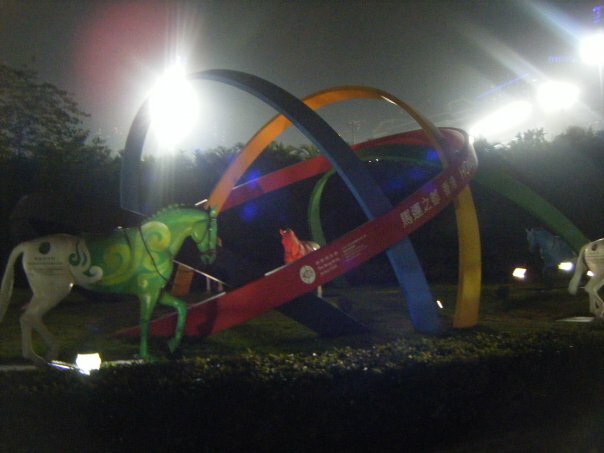 The statue greeting visitors as they entered the Happy Valley racecourse. Pretty impressive, I think. 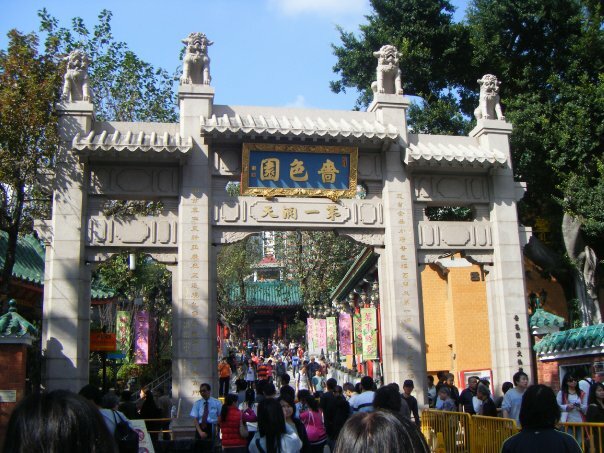 Wong Tai Sin Temple – one of the many temples somehow wedged into the tiny island of Hong Kong. And since this was close to Chinese New Year, people were out en masse to pay their respects and make wishes for prosperity (like Christmas time at the local shopping mall). 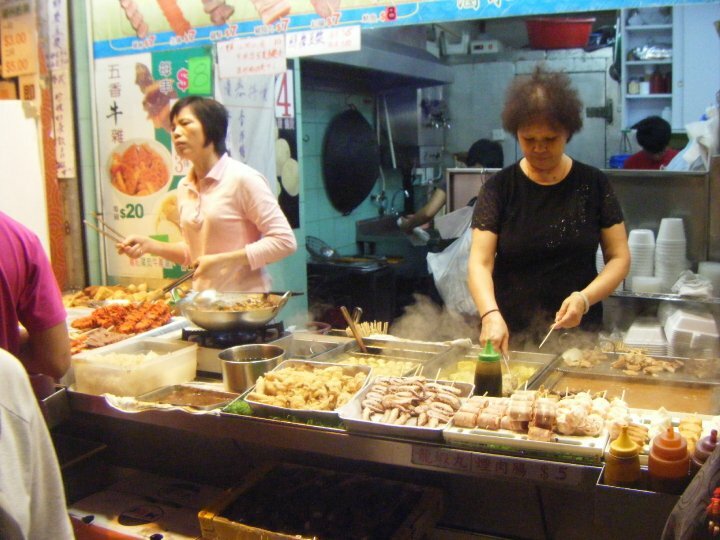 This entry was posted in Asia, Hong Kong and tagged Asia, HKUST, Hong Kong, Menu, study abroad on February 27, 2014 by Paige N..